Many times in penetration testing engagements you will discover authentication forms that you will need to bypass in order to gain access to an application or to a remote system.Having a big and a good wordlists always help but as a penetration tester you must be able to create your own custom wordlists depending on the situation.There are a variety of tools that can assist you on this but here we will focus on Crunch. 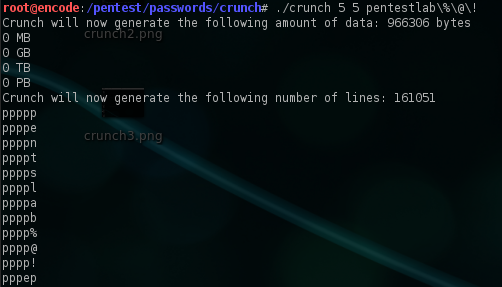 This will instruct crunch to create a wordlist that will have minimum length of characters 5,maximum length of characters 5 with the characters of admin and it will save it on a .txt file called pentestlab as you can see it and in the image below. The same method applies and if we want to create a wordlist mixed with letters and numbers. This is because some special characters need escaping and the \ is used before the character. This will generate wordlists which will be 1Mb each and with 6 characters size and it will include the characters 0123456789. 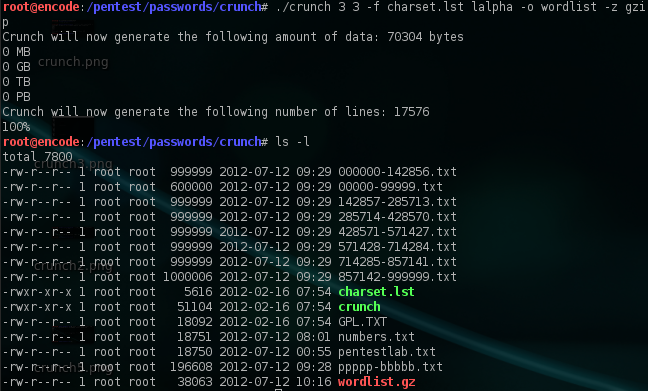 Crunch allows us to specify the number of words in each wordlist.This will create a wordlists that it will contain 20 words maximum by taken a specific charset of lalpha which is [abcdefghijklmnopqrstuvwxyz]. Alternatively you can use any other charset from the list that comes with crunch if you don’t want to use a custom charset. You can compress your wordlist with the -z option using either bzip,gzip or lzma. Creating wordlists can facilitate your needs when performing a penetration test.Crunch of course offers a variety of options and combinations that a user can play with.Trying to brute force of course an application or a system with a wordlist can of course lock you out depending on the account lockout policy but it always helps if you can have your own custom wordlists that may be help you to obtain access. Great, clean and concise walkthrough. Thanks! Is it better to use full list with a lower case words, or all upper, or just leave it the way it is ? It is better to use a combination of upper case and lower case characters along with numbers. 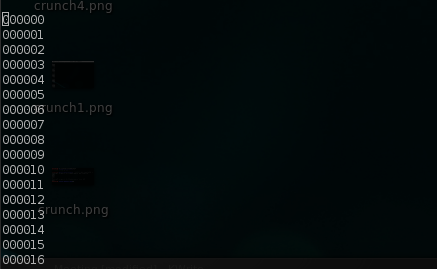 The problem is = No such file or directory” when trying to use “-o”. can anyone tell me why? I have been trying to create a list using ! 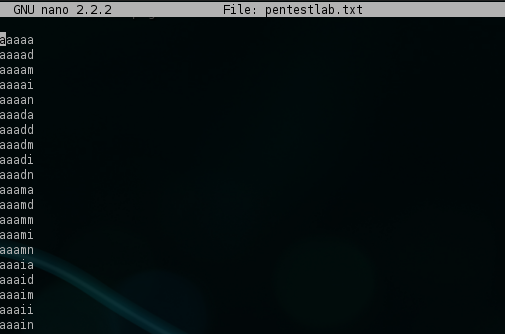 and a few others (see below), but as soon as I try and run the command it gives me a “bash: ! @wsx]: event not found”. How do I include these characters in my wordlist?